The Dolmabahce Palace, along the shores of the Bosphorus River in Istanbul, was built between 1843 and 1856 for Sultan Abdülmecidu. He decided the 72-acre Topkapi Palace no longer met the needs of the royal household. 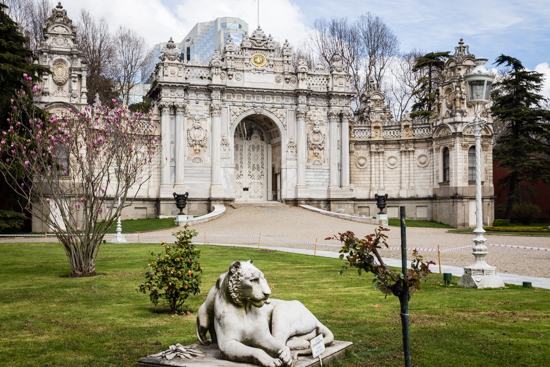 Six sultans went on to use the Dolmabahce as their home before the Ottoman Empire fell. 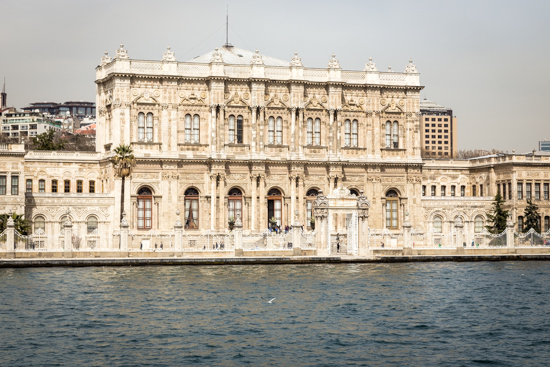 Dalmabahce Palace as seen from my cruise on the Bosphorus. The massive 161,500 square feet building consists of three parts: the State Apartments, Ceremonial Hall and the Imperial Harem as well as other small buildings. High walls and iron fencing with gate openings to the shoreline surround the palace. The grounds and blooming gardens feature spectacular ponds, statuary and scenic pathways. Statuary by the side gate. The construction employed Western style architecture including Baroque, Rococo and Neo-classical styles along with newer interpretations of traditional Ottoman elements. The marble exterior looks like intricately etched scrimshaw. If you could count, you’d find 285 rooms, 44 halls, 68 toilets and 6 hamams or Turkish baths. Detail in the exterior of the palace. The halls boast lavish decor and are filled with immense chandeliers, dripping with multi-tiered and multi-faceted crystal prisms. The Imperial Staircase incorporates extensive use of crystal objects d’art including the balustrades that bounce light coming from the glass and iron-vaulted ceiling. The Grand Ceremonial Hall, used for official and state ceremonies, is the most magnificent and opulent room. It shimmers and glows and screams wealth. This room alone measures 21,500 square feet. One statistic I read claimed the palace ceilings were embellished with 14 tons of gold leaf. Fifty-six columns support the dome hovering 118-feet above. The dome ceiling cleverly employs tromp l’oeil painting, tricking the eye into believing it is even grander. In 1853, Queen Victoria presented the reigning sultan the hall’s focal point: a 4.5-ton crystal chandelier. At the time, it was considered the largest in the world. The floor is covered with a 1,335-square foot Hereke carpet, Turkey’s finest carpeting. On special occasions the sultan’s golden throne was brought over from Topkapi Palace. 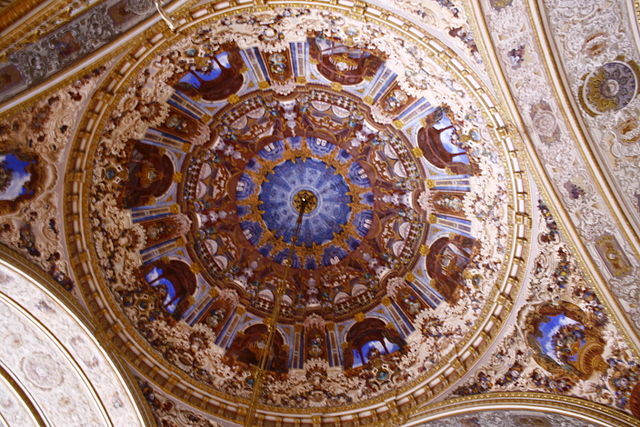 Dome in the Ceremonial Hall. A separate tour is given in the harem where the sultan’s mother, wives, concubines, and princesses were housed. The guide on this tour seemed more knowledgeable, but perhaps sugar coated harem life. I left wondering about jealousy and bed hopping. The third building was the men’s quarters, or selamlik, and also the place for official business in Istanbul. We also toured this section of the place, recently converted into an art museum. Judy noticed that the interior decor was even more impressive then the harem section. The grandiose design and construction of the palace cost five million Ottoman gold liras, the equivalent of 35 tons of gold, or more than $1.5 billion today. To finance this indulgence, massive amounts of paper money were issued along with the acquisition of foreign loans. This situation deteriorated the treasury of the Ottoman Empire to the point of eventual bankruptcy. Several Turkish wars ensued with Mustafa Kemal Ataturk leading the struggle for independence. The Turkish Republic was born in 1923 with Ataturk chosen as the first president. He modernized the country and is still most beloved by Turkish citizens. 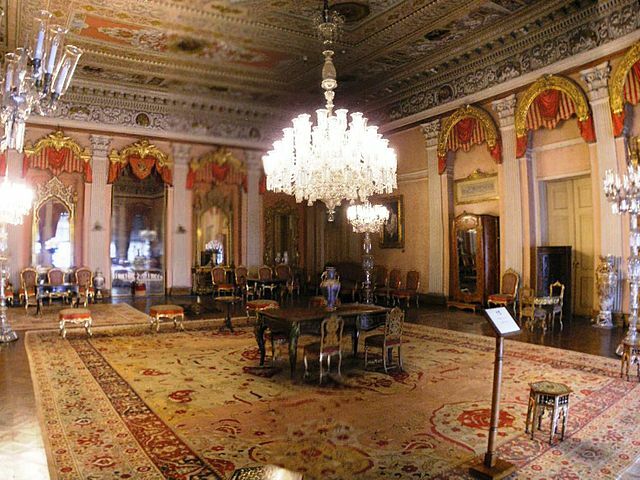 Ataturk’s Room in Dolmabahçe Palace, photo from Ramon, Wikimedia Common. 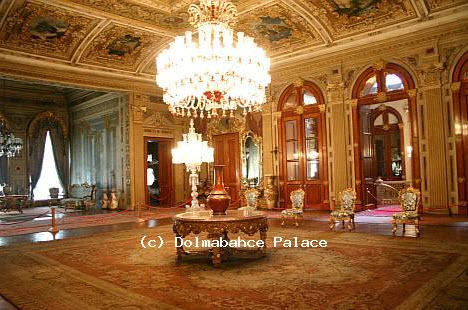 The Dolmabahce was used for protocol and state visits between 1925-1984. 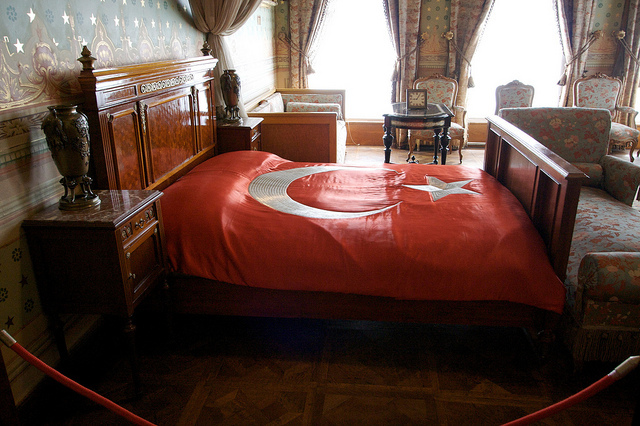 Ataturk occasionally occupied a small room there and died in the palace on November 10, 1938 at 9:05. All palace clocks remain stopped at 9:05. 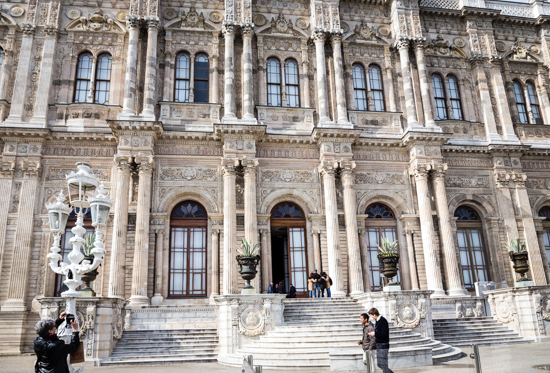 Dolmabahce became a “museum palace” in 1984. If you go: Purchase the full ticket (not partial) that permits entrance into all the main buildings. Plan to spend most of the day. You taught me about harems–I had no idea mothers lived there too. Christine, I learned a lot, too- the obvious benefit of travel! In fact, the Sultan’s mother was considered the highest woman, had the largest suite and entourage and over saw the running of the harem. I’ve always wondered what this palace looked like inside. I was tempted to try and visit, but it seemed like there were so many other things on my check list of places to visit in Istanbul. I’m glad you share this place so I can relish it for maybe another visit to Istanbul. The locals describe the palace as “the stuffed one,” referring to its over the top opulence and knicknacks, a reference to the popular dolmas, rice and spice-filled grape leaves. “Dolma” means stuffed.